2018 is over, but the excitement from all the new and redesigned cars hasn’t died off yet. Even though we are facing some brand new car models for 2019, it’s always fun to reflect on what was a hit from last year. Now is the ideal time to score one of these 10 best new cars for 2018 at an amazing price if your dealer has any left. With more and more automakers reworking their lineups to feature more crossovers and large SUVs, it’s no surprise that several of the best new cars of 2018 fell into these categories. But with Japanese sports cars and Korean super-sedans making the cut as well, 2018 wasn’t all about gas-guzzling family haulers. Just for kicks, let’s start there. 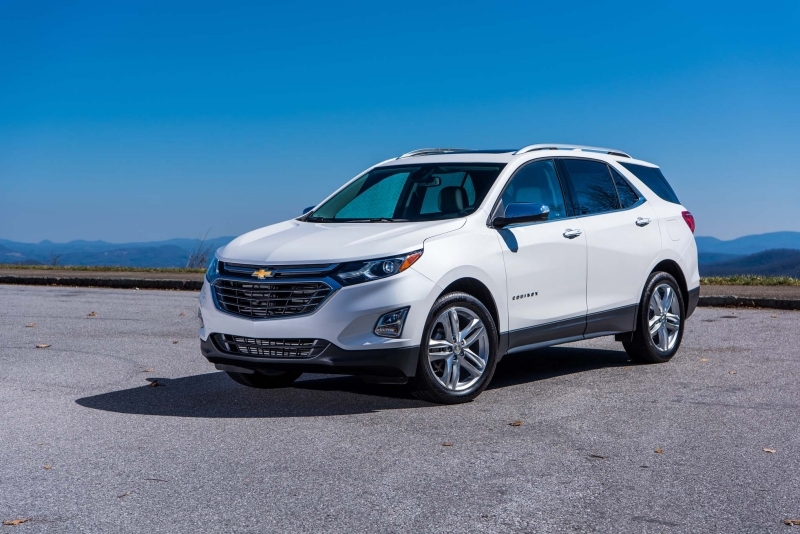 The redesigned Chevrolet Equinox is a safe bet if you want a compact crossover that has plenty of features. All the new 2018 Chevys came with a touchscreen infotainment system, Android Auto, Apple Car Play and a built-in Wi-Fi hotspot. Yes, the Equinox isn’t the most powerful in the bunch, but there is an efficient turbo-diesel engine and lots of room to hold your gear and five grown people. On top of that, it’s priced lower than many other crossovers, making it one of the best values of 2018. It was high time for a redesign of the Tiguan and we finally got one in 2018. The 2018 Volkswagen Tiguan came with more modern styling, upgraded tech features and an optional third row for additional versatility. Unfortunately, it did only come with one engine: a four-cylinder that produces a scant 184 horsepower. On the bright side, this provides better fuel economy than the 2017 model, making it ideal for growing families. Probably the last thing you thought Kia would produce would be a high-performance sports sedan, but they did it. We first saw the 2018 Kia Stinger at the Detroit Auto Show and we instantly knew it would be a success. There are two engine options: the twin-turbocharged 3.3-liter V6 that pumps out 365 horsepower, and the milder 2.0-liter four-cylinder. The choice is clear. Not only can this car go from 0-60 mph in 5.1 seconds, but all-wheel drive is available as an option. Plus, there’s enough room for five passengers. Considering the starting price was just over $30k, it offered strong performance and far more value than its German rivals. Lexus had a busy year, but that didn’t stop them from updating their flagship sedan. 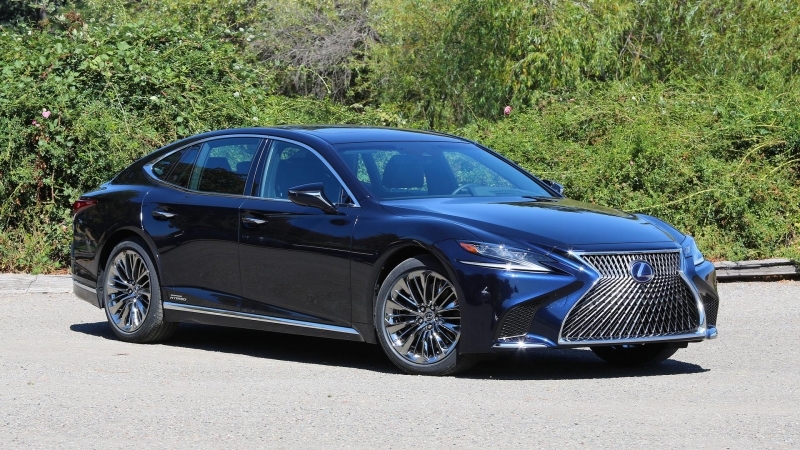 The 2018 Lexus LS came to us completely redesigned with a coupe-like silhouette. It became longer, wider and lower than ever before, with an additional 1.3-inches added to the wheelbase. The standard engine is a twin-turbocharged 3.5-liter V6 which produces 415 horsepower. That’s paired with a ten-speed automatic transmission and your choice of rear-wheel drive or four-wheel drive as an option. They even offer four-wheel steering as an option as well. This luxury sedan isn’t in everyone’s price range, but it does feature some extensive safety technology. In fact, it includes a new Pedestrian Detection System which automatically steers around any pedestrians, making the Lexus LS one of the most advanced passenger cars on the road today. This new small four-door crossover has a low starting price and aggressive looks. It’s efficient, practical and sporty. In fact, the 2018 Toyota C-HR was first designed for the Scion brand, but since that isn’t around anymore, it wears a Toyota badge. The new C-HR comes with emergency automatic braking and pedestrian detection as standard equipment. It also includes adaptive cruise control and lane-keeping assist. The coupe appearance helps this five-seater look like it only has two doors, but the rear door handles are hidden in the roof support pillars for easy access to the back. With a 2.0-liter four-cylinder engine and 144 horsepower, it even manages to achieve 29 mpg combined for maximum efficiency. That means the 2018 Toyota C-HR is perfect for young drivers, though its price might beg to differ. Subaru debuted the 2018 Crosstrek at the Geneva Auto Show. It was their first update to their widely-praised crossover since 2012. The Crosstrek now features more refined on and off-road driving abilities, plus they added advanced safety measures like the EyeSight driver assistance system. This compact wagon features a 2.0-liter four-cylinder engine that pumps out 152 horsepower. It’s paired with a continuously variable transmission or a six-speed manual option, and it’s great for fueling an adventurous spirit. At the opposite end of the off-roading spectrum is Land Rover, who continued to grow their family with the 2018 Range Rover Velar. It’s constructed on the Jaguar F-Pace platform and ranks at the top of all the luxury compact SUVs. They even offered three powertrains in 2018, including a supercharged V6 with 380 horsepower, a four-cylinder diesel and a four-cylinder turbo gas engine. All-wheel drive comes standard and there’s available air suspension for off-road adventures. Of course, this amount of luxury does add to the expense. It starts right around $50,000, but it’s in the perfect spot between the automaker’s Evoque and Range Rover Sport. Lexus also offered the all-new LC for 2018. This high-performance luxury sports coupe came from the LF-LC Concept that debuted way back in 2012. There’s the LC 500 with a price tag over $90k, and the hybrid version which adds another $4,000 to the price. Both feature a 2+2 seating setup, so there’s not much space in the back for passengers. With the V8 engine that produces 471 horsepower or the 2.5-liter V6 hybrid powertrain, and with intense styling including a full glass roof, the Lexus LC is in a class of its own. 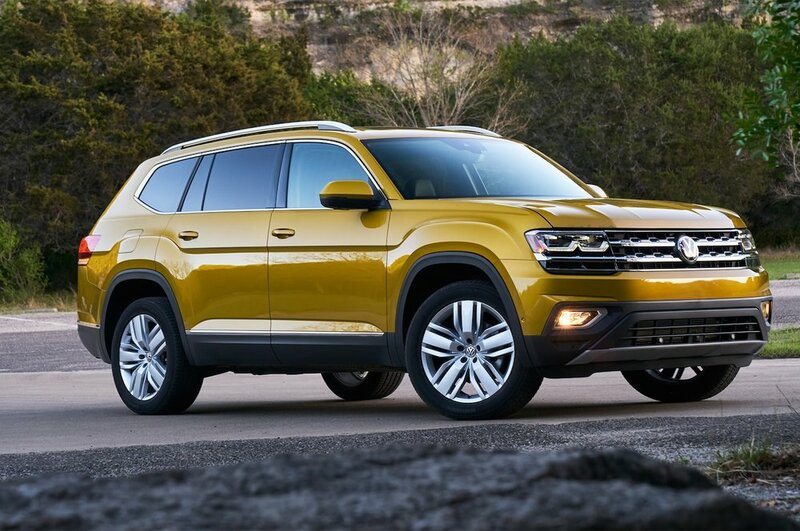 The 2018 Atlas is a seven-passenger SUV built at VW’s Tennessee plant. It rivals the Toyota Highlander and Honda Pilot and is available with an efficient four-cylinder or more powerful V6 engine. The downside is that getting into the third row is challenging. However, you can fold down both the second and third rows of seats to access 96.8 cubic-feet of cargo room. All models come with available AWD and an eight-speed automatic transmission. The 2018 Volkswagen Atlas is perfect for families that need more space than a Tiguan and think the Range Rover Velar is a little too much. A list of the best new cars of 2018 simply wouldn’t be complete without the Dodge Challenger SRT Demon. It’s the most powerful V8 production car ever made and the fastest to 60 MPH. 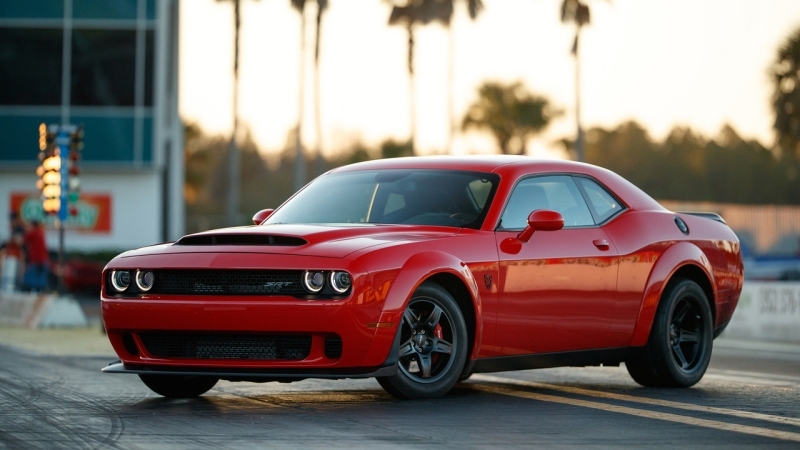 The Demon comes with 840 horsepower that takes the car from 0-60 mph in 2.3 seconds. To access this type of power, you need to purchase the standard 808 horsepower 6.2-liter HEMI Demon V8 with a high-performance powertrain control computer that bumps up the high-octane fuel setting to deliver the full 840 horsepower. Thanks to Dodge’s incredible engineering, you’re in for a wild ride. How about you? Do you know of any vehicles you think we should add to the best new cars of 2018 list? We would love to hear about them! Drop us a comment with your suggestions. Newer PostWhat is a Lienholder? How Do They Affect a Car Title? Older PostJunk Title and Salvage Title: What's the Difference?